Big Red Car here. OK, Old Sport, summer is here. Going to have a few isolated thunderstorms today and then it is going to to be hot, hot, hot for the rest of June. Oh, I love summer! Summer in the ATX! On Earth as it is in Austin, Texas! So, let’s get back on the Company Culture rant and today we are going to talk about the notion of Clear Definition. WTF, Big Red Car, what is that? As a general proposition, folks want to know “the” plan. Why not? They are being asked to invest their entire professional life in a single company, led by a single guy [Well, he could be married but you know what I mean, right? Haha, Big Red Car, you are not nearly as funny as you think you are. Haha.] and with a set of foundation concepts and their livelihoods are completely dependent upon the quality of that planning. Remember — Vision, Mission, Strategy, Tactics, Objectives, Values and Culture? Well, you should as they are the building blocks of a healthy company and it upon them that the Company Culture will be based and grow. So, the first notion of Clear Definition is that the company leadership has, in fact, done this work. Pro tip: and also that they are revisited from time to time as the shelf life of each of these elements is contracting with the Internet Age and all such stuff. What parts of the foundation documents actually touch the individuals who will be doing the real work of the company? That begins with the tactics — the annual business plan, really — which are then organized and assigned to individuals as objectives. We have spoken of this before — Strategy v Tactics v Objectives. Read about it. Also here — Vision, Mission, Strategy, Values >>>> OBJECTIVES. It is when the tactics are subdivided, organized and assigned to individuals that they become real and clearly defined. Folks want to receive clearly defined objectives as part of their annual work plan or their Basis of Employment. This written delivery of objectives is the Clear Definition that folks are looking for as a part of defining their role in the company and as a personal foundation for their participation in the culture of the company. It bears repeating that objectives should be written and SMART (specific, measurable, attainable, realistic and time constrained). If you are not doing this, start doing it. NOW! These same objectives should form the basis for the company’s performance appraisal system wherein the company appraises individual performance on a twice yearly basis. Go over the objectives and see which ones have been accomplished and which ones have not. Do not be afraid to change your mind and throw some overboard if they no longer make sense. How does this tie into Company Culture? Company Culture is the manner in which the enterprise goes about accomplishing its business objectives — it is not grammar school recess. It is the esprit de corps or the joie de vivre which propels the company and its folks toward the attainment of specific business objectives. This is not a fraternal organization, it is a business. And, you, Mr CEO, have got to remember that the Company Culture is only useful to the extent it facilitates the attainment of the business objectives which are part of your Vision for the company. Otherwise, go buy an Airedale puppy who will really love you and lick your face on command. Not too good at marketing but very good for your ego. The Company Culture is built based upon values. The values are both part of the Company Culture and the foundation of the Company Culture all at the same time. Objectives, when done correctly, empower and release the talent of the team. This requires great planning and even better communication and reinforcement. When they are attained, they should be recognized and rewarded and the folks responsible should be given progressively better compensation and responsibility. 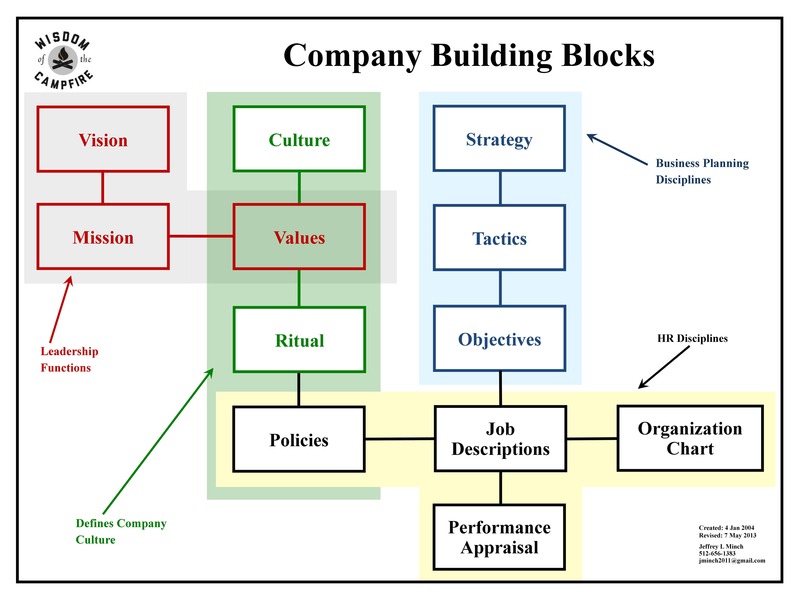 In this manner, it easy to see that the Clear Definition of objectives and their artful scorekeeping through performance appraisal are critical elements in building a robust Company Culture which facilitates the attainment of the objectives which are the basis for the tactics, strategy which will accomplish the Mission and Vision laid out by the CEO. It all ties together like individual colored threads making a lovely tapestry. This entry was posted in CEO, communication, company culture, Employees, empowerment, Inspiration, Performance appraisal, strategy, Success, Wisdom of the Campfire and tagged clear definition, company culture, objectives. Bookmark the permalink.